How to choose a fifth highlight from the year? Easy, pick several instead. There are plenty of exciting moments during the year and if it feels reductive to limit it to five, then even sticking with 10 means leaving out plenty of good times. We might find overlapping races incongruous but this can mean twice the action. Here are some more of the joyous moments from 2016. Giro d’Italia: Vincenzo Nibali cut a sorry figure going into the third week of the Giro as he sat in third place overall and there seemed to no way to overhaul his rivals. 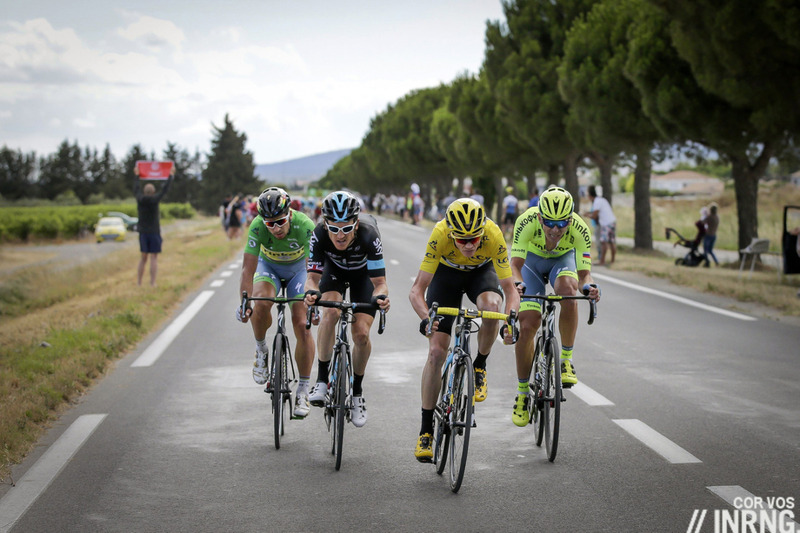 Steven Kruijswijk looked indestructible and Esteban Chaves was floating up the climbs. It left the Sicilian shrugging and shy, constantly having to explain himself to a home audience used to him winning yet now trailing a Dutchman with name they struggled to pronounce. But in the space of a weekend Nibali turned things around. 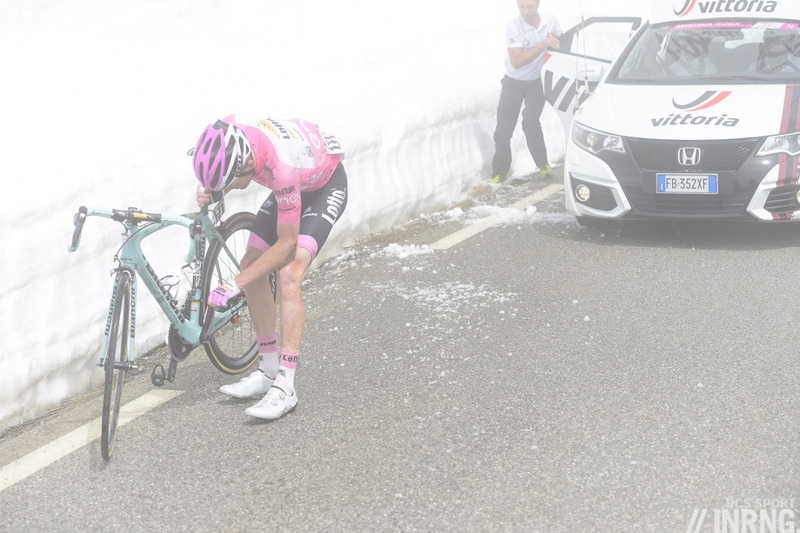 First Kruijswijk rode into a snowbank, crashed and then found himself without much team support (a sorry moment rather than a highlight but Dutch fans have plenty to look forward to for next year’s race). 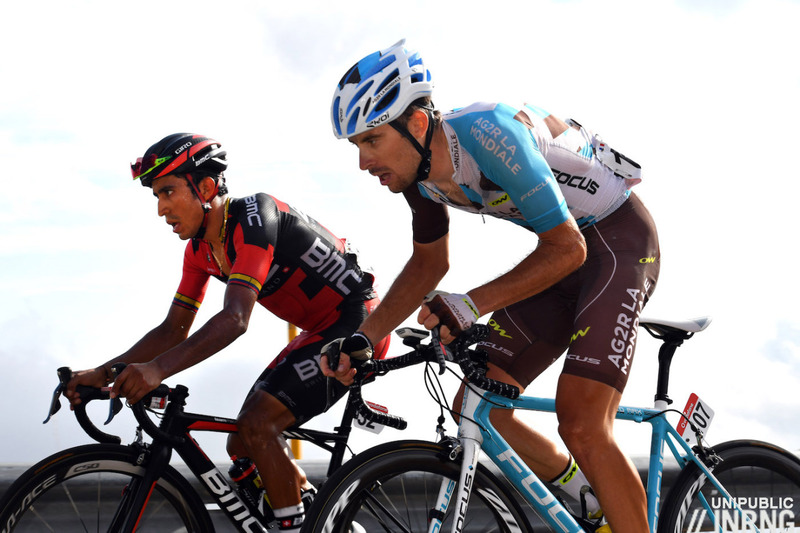 Chaves took over the race lead going into the final mountain stage but had fallen ill and could not withstand Nibali’s attacks. The collapses of Kruijswijk and Chaves were not highlights but they marked the only grand tour to have a surprise ending and see the leader’s jersey change shoulders so regularly which makes the whole race as a whole a highlight rather than narrowing it down to a single moment but if you wanted to view a stage again then the 132km sprint from Bressanone to Andalo was gripping; Nibali was on the rack that day. Chaves was a highlight, for example congratulating Nibali when others might have sulked and recently won a media award from journalists for his politeness and availability. Vuelta a España: sometimes the stage battle can be so gripping that you lose sight of everything else. On Stage 20 Pierre Latour and Darwin Atapuma were trading punch-drunk attacks on the Alto de Aitana while the battle between Chris Froome and Nairo Quintana lower down the mountain didn’t matter. Sure Quintana looked secure in the red jersey but the action was so good at front as Latour surged again and again with the kind of demented energy you normally see in the first hour of a junior race rather than the final mountain stage of a grand tour late in the season. Ironically Latour was yoyo-ing Atapuma whose trademark climbing style is his darting accelerations and disruptive unpredictability. The duel raged while Mathias Frank was nearby and Fabio Felline began to close in. With the finish line in sight the Spanish TV commentators gave the win to Atapuma only for Latour to churn a huge gear and overtake Atapuma. The Vuelta also supplied plenty of other moments. The “Froomigal” stage was exciting but one of those moments where the drama is high at the start and then fades, the longer the stage went on the clearer the scenario became. 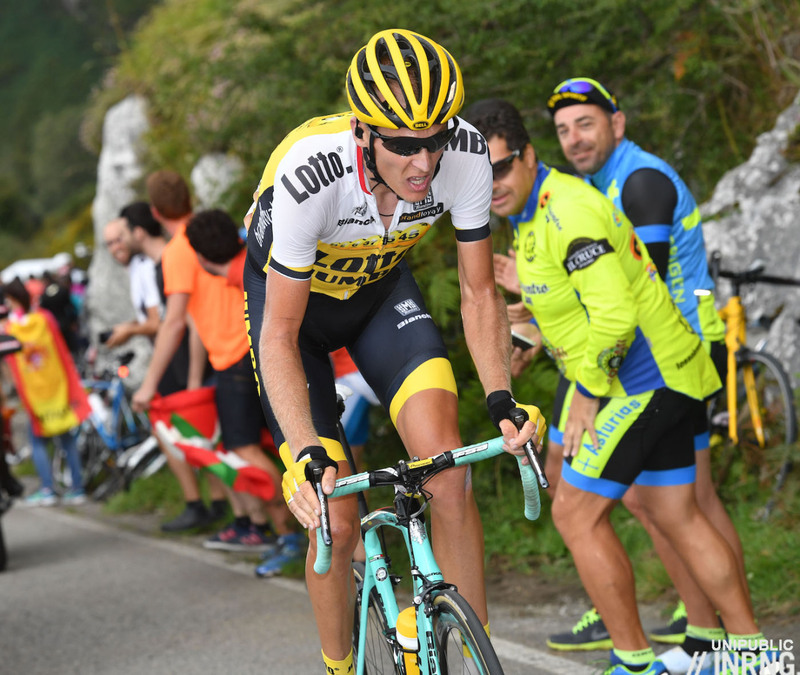 Robert Gesink’s stage win on the Aubisque was enjoyable because a breakaway stuck and because Gesink finally had the stars align after suffering from rotten luck time and again while. Chris Froome and Nairo Quintana recreated Aesop’s fable of The Tortoise and The Hare with Froome pacing himself up the climb and losing 30 seconds early on the slopes of to the Lagos de Covadonga only to get back into contention. Tim Wellens took a huge win in the Tour of Poland only nobody noticed. Or at least few did as the Polish race was moved to July to avoid a clash with the Olympics only it coincided with the Tour de France. 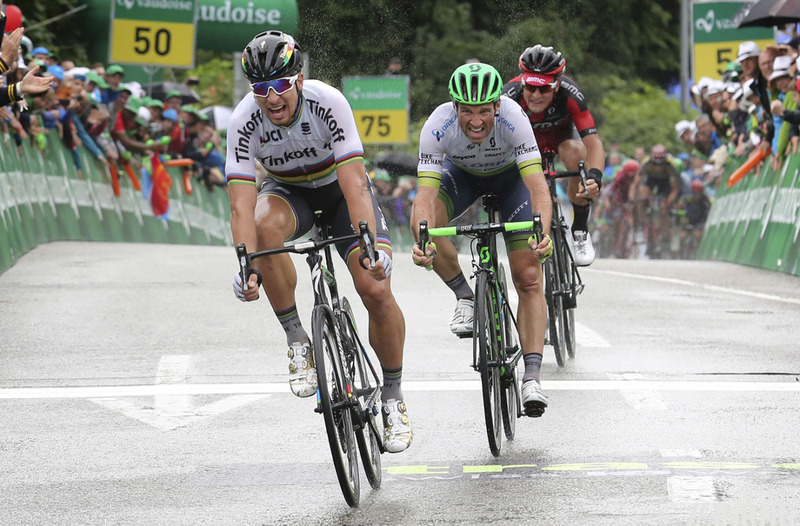 While Mark Cavendish won his third stage of the Tour in Villars-les-Dombes, Wellens took a solo win in Zakopane. Wellens finished solo, some 3m48 ahead of Davide Formolo and on a day of diluvian downpours where they needed the fire brigade to pump water to keep the roads open and 86 riders riders abandoned the race, a day that merited the E-word. Wellens was strong but benefited from Tiesj Benoot’s marking behind and overall this was a big win that didn’t get the coverage it deserved. The Tour de France was boring, right? Actually it had plenty of good moments. Froome’s Ventoux run was memorable but hardly a racing highlight. Instead his breakaway into Montpellier with Peter Sagan and a team mate each in Geraint Thomas and Maciej Bodnar was a thrilling end to what was supposed to be a sprint stage. Jarlinson Pantano had a great Tour de Suisse and turned this into a better Tour de France. The sprints were exciting and if Mark Cavendish was the best his wins weren’t the formality they once were, there was suspense right up until the final metres. Romain Bardet’s raid to Le Bettex was great. He attacked on a descent and had team mate and good friend Mikaël Cherel to pace him on the valley before tackling the awkward summit finish via the nasty Amerands road. On paper this was a wild move: pull out a few seconds on the descent and then stew on flat approach roads before being gobbled up and spat out by Team Sky’s mountain train. We might not want it so but we can at least understand why few dare to challenge Sky’s tractor beam. 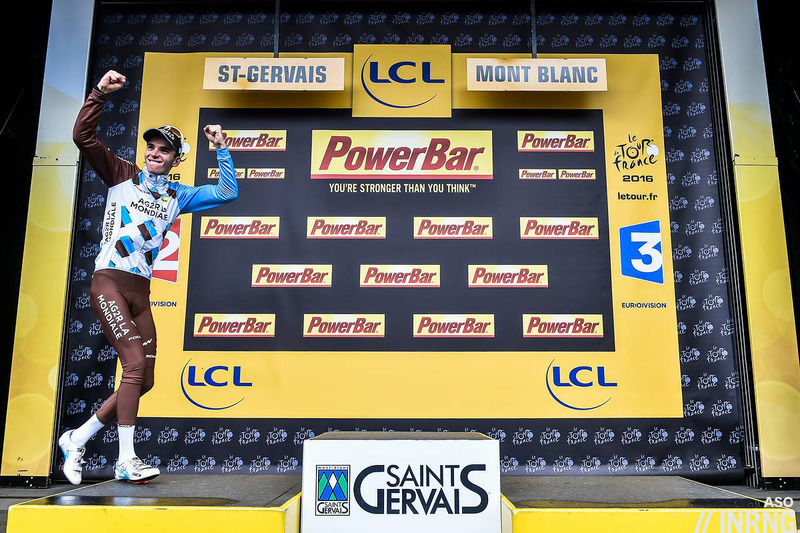 Bardet dared and won. He was helped by Froome’s crash but was up the road when that happened and the dicey Domancy descent was a good place to be away from a bunch of chasing riders. Bardet held on the win and through this ride climbed onto the podium of the Tour de France. What about Peter Sagan? In some ways he’s a highlight alone for the way he carries himself in a race, he seems to be able to do things that others can’t. He helped enliven the Tour de France and provided a thrill in the E3 Harelbeke where he ultimately lost to Michał Kwiatkowski but perhaps his Tour de Suisse stage win (pictured) was the masterpiece, attacking late in the finish while a break was up the road looked like showboating but he rode across to the escapees and then beat them in the finish. He’s also growing into a more interesting personality as he’s able to express himself better in English and reach a larger audience. Talking of the Tour de Suisse we got a good contest between riders and the podium wasn’t certain until the last moments of the last stage. Miguel Angel Lopez showed panache by attacking in the yellow jersey to defend his race lead. The Olympics offered two good road races but neither made the cut as one of the prime highlights because with hindsight the results were too impacted by the crashes. This doesn’t negate the victories, simply that these accidents marred the moment. 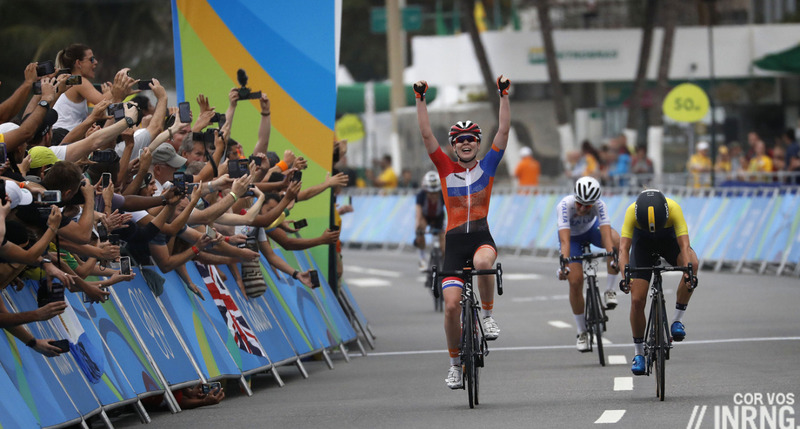 Especially in the women’s race it great to see Anna van der Breggen win but hard to enjoy it because as she punched the air many of us had our fingers crossed after seeing Annemiek van Vleuten pivot into the gutter. The Eneco Tour was good. It’s underrated, the corporate brand name means it’s not obvious to give the race a sense of place but think of it as a “greatest hits” of the spring classics revisited in September. Season-fatigue can set in for riders and fans alike but this delivers action. Similarly the GP de Wallonie always has a lively finish when the race storm’s Namur’s citadel. Another late season special is the Schaal Sels, the best race most have never heard of. Wout Van Aert won this year, deploying his skills on the farm track sections but also showing his form ahead of the cyclocross season while many road riders are turning stale and all on an unrestricted livestream. Among the race courses Paris-Nice tried some gravel which was new but wasn’t decisive by itself on the day, instead the best use of gravel remains the Strade Bianche as it’s real rather than contrived. ASO’s best innovation might have been the Dauphiné “Donkey Kong” prologue: usually time trials these don’t make for good TV but this was an unusual format up a ski slope, or at least a road that had been freshly paved to serve the ski lifts. Tony Martin railed against it but the format supplied a bit more suspense with Alberto Contador winning ahead of Richie Porte and Chris Froome. Briefly it looked like Contador was going to be a force in the summer. Any tech highlights? I wanted to pick one but it’s hard to think of a new product that’s hit the market and made everyone go “wow” or open their wallets. Amid the broadcasts data telemetry and onboard videos are still in their infancy and for the most part just add noise. Perhaps online cycling training software Zwift made a name for itself with Mathew Hayman’s Paris-Roubaix win. Yes Hayman needed it because he could not ride outdoors with a broken wrist but as a method it also allows for sustained quality during training as there are no pauses for junctions and traffic lights and so an hour’s riding is an hour’s riding. Any more highlights from the year? A race, a rider, a course, a moment or some tech? If so please share in the comments below. As a Dutchman and a personal fan, Wout Poels winning LBL in heroic weather after recovering from his horrible 2012 crash was a personal highlight. I’ve got very fond memories of the Tour of Flanders seeing Sagan take it. While Roubaix was thrilling in its own way, the ToF had a very good build up in suspense, with lots of tactical attacks by outsiders made in the last 40k, which made the race compelling to watch. After 5 years I think it’s safe to say the new course is a great success. Ultimately though the most captivating moment of the year was seeing Froome run up the Ventoux. A highlight that’s really a lowlight. Thanks for the coverage INRNG, looking forward to your 2017 previews. Every one of the monuments was decent this year, usually one fizzles and while LBL wasn’t thrill a minute the weather was something else and the conclusion genuinely gripping. MSR was a good edition albeit witht the controversy, but the slow shredding of the group was a little faster this year and the tangle at the end caused even more excitement. Flanders was a vintage edition as you said, but Roubaix and Lombardia were perhaps some of the best ever. On note of Chaves, in interviews and generally how he carries himself he seems like a genuinely nice and endearing character. With that big smile even when things haven’t gone to plan. However I remember listening to the cycling podcast a couple of months back where Richard Moore mentioned in passing that there were grumbles from a few Colombian journalists that he wasn’t really as nice as he appeared (Richard Moore confirmed personally he had always found him to be friendly and approachable). Anyone know what this is or just moaning that he might not give them as much time as they would like or expect? I heard this too but have not heard any more, he’s bound to have his bad moods and moments where he needs to say “no” to people as well. Yes, Chaves does have an edge to him, particularly when it comes to Colombian journalists. This behavior though is typically reserved for non-cycling journalists who didn’t know he existed until last year’s Vuelta a España and are only latching on now that he is winning things and asking him inane questions. This also goes for local politicians, who show up to claim they’ve always supported him and blah blah blah. Chaves’ response to these two groups is not dissimilar to that of fun-loving Urán, who can turn surly when faced with this. It was Danial Friebe who said it, that the Columbian press thought him more complicated/complex. If any one knows the story of his horrific accident in 2013 you’d know why he’s always so happy & smiling & why he is so grateful to the team. Anyone who’s seen a Back Stage Pass by the team can see how genuine the affection is – it goes both ways. Friebe has since watched lots of BSPs since that comment & has more respect for the team & Chaves. I love that Suisse stage! The Eneco Tour is usually an under-appreciated highlight although I thought this year’s was a little TT heavy. GP de Wallonie is a spectacular finish and another undervalued race, as you say. I really enjoyed Le Samyn as well, the first time I’ve managed to catch it, but it was pretty epic and a great win for Terpstra. It was also an unusual year in that all the Monuments delivered, as did Omloop/E3/Strade Bianche etc. The only classic that never quite works for me is Amstel. Agree about Le Samyn. I thoroughly enjoyed that one. Terpstra was masterful in coaxing out *just* a little too much gas from Scott Thwaites and then jumping at the right time. But I was sos impressed that Thwaites toughed it out and brought home second on a really horrible day. He had an impressive Spring campaign too. Other highlights were some of the great crowds – Aussies, Basques, huge crowds in Holland for the Giro, Yorkshire, Italians and Belgians. And the video of the crowd on The Struggle in the Lake District for Brad Wiggins was fantastic. Great season, can’t wait for the next one! So many genuine contenders for the win ramped up race anticipation this year. Loved seeing Greg Van Avermaet come into his own, Steve Cummings’ successful plotting, and the fashion-forward Romain Bardet placing in his home Grand Tour. Hipster choice? Imanol Erviti’s spring performances in RvV and P-R.
No one tech highlight as such, but the range and quality of cycling kit is impressive compared to just ten years ago. Decent stuff is very easy to come by whether your price point is Aldi or Assos. Breakout Rider of the Year in my book was Gianluca Brambilla. I’ll be honest and admit I don’t think I’d heard his name much before this year (I am relatively new to the sport though) but his performance at Strade Bianche certainly caught my attention. Then a stage win and two days in pink at the Giro. Topped off with being the first one to really ignite the stage to Formigal, and finishing it off with the stage win. And don’t forget about stage 18 in the Giro – he and Moser coming into the finish, looking for all the world like a sprint between the two of them, until Matteo Trentin appears out of nowhere to take the win. Gianluca was wise to hold off on sprinting for a win that could have been his, in favor of giving a teammate a higher-likelihood chance for that win. Were I a pro cycling manager, I’d want Gianluca on my team. 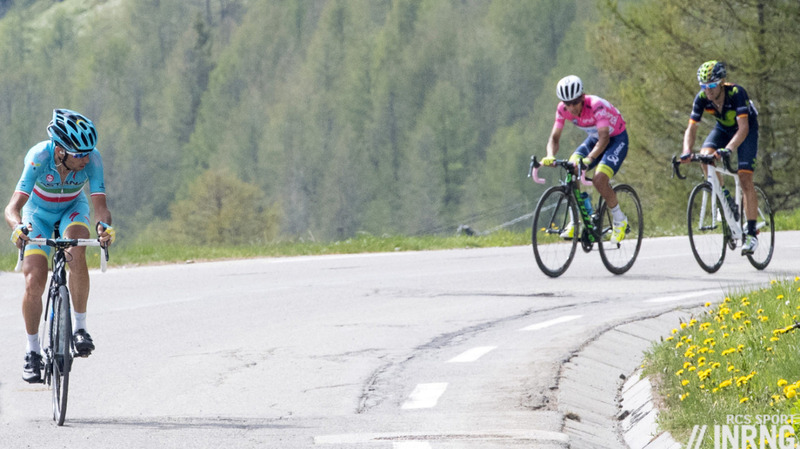 Great shout, that Trentin stage win was ridiculous, a really good edition of the Giro. *Ridiculous in a good way! For me, one of the highlights was definitely the stage to Montpelier. I was attending a wedding in France that day and was very nearly late as the road was blocked off because of the stage ! Made it on time and at the end the groom asked me to guess who had won the stage and who was second. The shock I had when he told me that it was Sagan then Froome ! The next day driving back from the wedding, I was listening to the stage on the radio and when Froome attacked, I told my girlfirend that the Tour was pretty much over. We then went through a tunnel and was then shocked when all I could hear was “Le maillot jaune court sur les pentes du Ventoux ! Froome n’a plus de vélo !”. But everyday I get to read this blog is a highlight so thank you INRNG for all of your hard work ! Agreed, another excellent review that makes me want to go back and watch them all again (a rare thing for me!). Thanks Inrng. The next day I was catching a flight back home when they hit the Ventoux. I was following news updates all day. I landed a little before 5 PM and turned on my telephone radio. Running back through the airport towards the trains to get home, I heard the excitement on the radio as they hit the Ventoux showdown. On the train, they radio caster shouted about Froome and again I was going mad, in a train coupe with random people around me. Two intense finales that I was lucky to hear both live on the radio, great times. Twas an epic season i was lucky enough to be on Ventoux for the Froome n’a plus de vélo incident, at first we thought it was a crazy fan! and to be there for Sagans wheely over the line at Flanders. How i miss the racing season …….. how long until the first classic 2017? This was an incredibly ambitious tick list bouncing between road and track when he announced it at the beginning of the year, and he was able to perform at each event. He won four road stages at the Tour after moving to a weaker team against all the top sprinters. His 4k pursuit time at Rio was 11 sec faster than his ride at the WC in March and 1 sec slower than Wiggins’ 2008 Olympic Record for the stand alone event. And if you ever get a chance to watch the final chase at Gent racing against De Pauw/De Ketele and Keisse/Vivianni, it’s an hour well spent. – the sprint level at the Tour was very mediocre at best; the expected battle royal turned out to be very disappointing due to the low level of form of most top contenders. Which isn’t Cav’s fault, obviously enough, but which is a very relevant element when we’re judging his main stint of triumphs on the road this year (if you have a look to the sprints’ results, you’ll notice that it wasn’t like he was constantly prevailing over Greipel, Kittel, Kristoff, Degenkolb and so on *all together in the mix*… in fact, the other supposedly fastest sprinters were having just a decent day from time to time, raising the bar from several stages in which they even struggled to make a top 5 against emerging guys whose level should have been clearly inferior, like Laporte, Enger, McLay etc. – no offense meant to the latter ones). All that considered, I think it’s right to turn the sportlight on Cav’s season to rememeber us that cycling isn’t just *road* cycling, yet Sagan’s season still looks miles ahead. Not because Cav’s wasn’t exceptional, but because Sagan’s was… more so. Valverde also deserves a special mention for the nice results he could achieve during a crazily shaped season. Whereas Froome and Quintana, for example, while having a peculiarly successful year for different reasons, were more or less meeting expectations. I think that, albeit perhaps inferior in results, I’d prefer Chaves to both of them, this year. But this is very personal. It looked to me that, this year more than recently, Cavendish was in excellent physical condition. Lost a little weight or rather toned / muscled up slightly more. He can seem a little cherubic but he looked really cut and solid this year. His conditioners and British Cycling got it spot on. To say nothing of his dedication and desire. I hope he can reach the TdF stage wins record. Absolutely so. And the Olympic year is usually special. That changes nothing when we’re weighing the level of his rivals during this year’s TdF, since you can do that through *their* performances, matched against a benchmark which doesn’t include Cav. Winning much in the TdF is always a great feat; in this case it’s *just a tiny little bit* less big than it looks like at first sight, or as it would be in other circumstances. On all 4 of Cavendish’s wins, 2nd place was either Kittel, Greipel or Kristoff. On same time as Cavendish in all 4 was Kittel and Sagan, Greipel was in the mix on 3 of the stages. It’s impossible for armchair fans to look at their form and guess to the level of the wins because we don’t have their power numbers. We can judge Cavendish’s form based on Kittel and Sagan’s results. Kittel was really fast this year and Sagan clearly was in pure beast mode, yet Cavendish beat him 4-times. I do think though that Cavendish’s season wasn’t enough to get him Male Professional Cyclist of the Year. Sagan gets the nod from me, he was a beast all year long. Some of his victories were cannibalistic, eg. TdF stage 11, Flanders, and Worlds. Nobody would have predicted he would win that sprint finish against Cavendish, but he did. And, as I said, it wasn’t just that they were pushing each other out of the podium, several secondary figures happened to be in the mix, as I said above. And I wouldn’t say that Kittel was that fast this year, not at all, especially when you consider his past standard! Look, it’s not just about the number, I’d challenge any sprint fan to defend that Kittel, Greipel or Kristoff were in great form at this year’s TdF. No need of a powermeter, frankly, to see that. I wasn’t ironic when I said that this situation reduces only slightly the relevance of the feat. Yet, it would be superficial to just ignore those circumstances. PS Sagan isn’t as fast as the purest sprinter in a normal stage, in normal conditions, nor should he be. In fact, he won just one sort of a “pure” sprint, the other two stages weren’t anything like that. Exactly, your last point shows that Kittel, Greipel, etc. were in pretty top form. Sagan was in the form of his life, but still was getting beat by Kittel, Greipel, Cavendish, therefore the top-3 sprinters were at or close to their peak form. Plus, every year secondary sprinters squeak in to claim a surprise win or claim some of the top placings. Anyways, we’ll have to see what 2017 brings, but I think that Cavendish’s track training in 2016 gave him the turn of speed to beat the best this year at the Tour. Check their past top performances and you’ll see that you might be wrong. Their performances were absolutely middle-low-key. Kittel, Greipel or Kristoff being in a great form and not even podiuming in more than half of the available bunch sprints?… odd, very odd. And compare the rest of the season, especially in terms of quality, with their best ones. Besides, in sprinting, generally speaking, a lot it’s about your muscle fibres, which is why a *faster* rider will beat a *slower* one in most cases, whatever the circumstances, if they come together to a bunch or reduced group sprint. It was both Sagan being in exceptional form and the others being a bit under their standard, otherwise in a normal flat stage of a stage race, you’ll hardly see Sagan prevailing, however good his form (again, check sprints in past years). Every year some secondary sprinter appears? Yes and no. Check last year, for example. There wasn’t at all such a number of not-so-top sprinters making a podium or even a top five. This year some 2-3 “lesser” (so to say, sorry guys) men were constantly in the mix. In 2014 there were less super-sprinters, still the top athletes in the sprint were more constantly the same. Haha, yeah exactly, it’s impossible for us to prove this. Let’s call it a draw and move on. Can’t wait for 2017’s TdF. A piece of tech that has been hugely overused this year, usually when nothing much is happening in the race, the onboard camera has few admirers at the moment. But there was one of the Derny races at this month’s Amsterdam Six where a rear-mounted camera caught a fantastic shot of three teams going head-to-head round the banking on the final laps. That WAS dramatic and gave fans a POV that they could never see otherwise. It also reminded me of one road race during the year – I can’t remember which one, unfortunately, but I hope Inrng does because I remember it being noted on here at the time – when there was good on-bike footage in real time of some sprint trains battling for position inside the last 10kms. Was Etixx one of the teams, perhaps? A couple of minor spotlights rather than a highlight, sure, but I hope we’ll see more of this type of shot and far less of the utterly dreary, repetitious and meaningless pictures of Joey Gregario riding behind Danny Domestique’s wheel in the middle of the peloton in the middle of the road in the middle of the race. I went to Primary school with a nipper called Christopher Isherwood. Stage 20 of the Vuelta was also when Chaves pulled off that amazing move from 40km out, bridging over to teammate Howson who led him down the descent of the penultimate climb, and then riding solo up the final climb to secure a podium spot on GC. Truly an awesome stage! Epic IMO. Did you watch the Back Stage Pass for that one? Fascinating. Class is permanent and Contador’s racing intelligence; Sagan’s brilliance and Cavendish’s brio were again on show in 2016. Kwiatowski on his Lightweights was a pleasure to watch for a large part of the 6 hour race in Rio. The year had an agreeable Colombian coda –Chaves at Lombardia and Gaviria’s specialness at Paris-Tours. Etixx may have topped the team list but Orica stood out, I’d say. Of course there were the highlights that many mention yet overall it seemed a lesser and sometimes tragic racing year in which motor bikes and then commissaires were dominant. …However, the previous two weeks also offered a lot of impressive stages where things went hot tens of kms (and therefore a good lot of time) before the finish line. The Dolomiti stage was brutal (in the good sense ^__^), but the daring move by Jungels towards Asolo isn’t to be forgotten, as the beautiful “sterrato” climb approaching Arezzo, with GC contenders making their move as soon as the ramps went harder. Those three were top-class highlights, but the Cividale, Praia and Aremogna stages were also quite good, with a bit of shaking in GC, too. The Vuelta was a rather good edition, and all in all, given the level of the contenders, I wouldn’t rate it lower than the Giro, yet only a total of *three* stages saw more than 20′ of real, thrilling action (four if we include Aubisque). In terms of both intensity and duration, while watching the Giro you happen to get something between memorable and *outright epic* in one of every three stages (an average which means that the second half of the race is stuffed with top cycling), whereas a good Vuelta’s average is more or less “once a week”. The rest tends to be, at least, entertaining, with the odd – and pretty much needed – boring stage here and there. What about the 2016 Tour… yeah, Le Bettex. 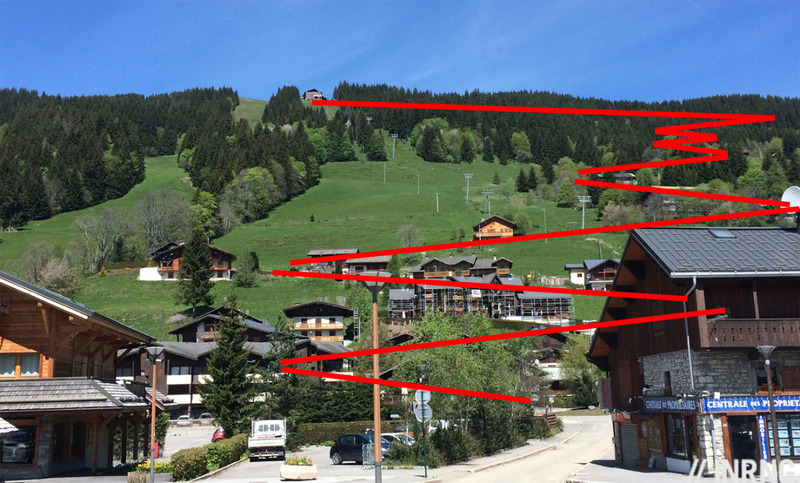 Which is in itself *several* steps below S. Anna, Risoul, Andalo, Corvara, Covadonga, Formigal, Aitana etc. IMHO the 2016 Tour doesn’t really deserve to be among the season’s highlights, despite having had several interesting or even great performances, more notably a calculating but also brave Bardet, the strongest Froome ever, a simply devastating Sagan, Cav’s Indian Summer… Interesting, indeed, but truth is that cycling is a great sport and in its main event it would be absurd that it didn’t produce anything relevant *at all*. In fact, cycling can also be way better than that, and this year *it was* on several occasions. The Tour itself, in other years, has been showing that it can be hugely better. I struggle to see why the need to include one of the worse edition in decades in a highlight collection, more or less on par with events which, on the contrary, really raised the bar. For me the absolute highlight of the year was the mens elite road race in Doha. Another windy race was tour of Turkey – several stages with brutal conditions and Magnus Backstage calling the moves with surgical precision. Next post: What Happened to the 10 Neo-Pros For 2016?